The action of Andrew Winer’s remarkably complex and multilayered work, The Marriage Artist, is the investigation into his wife’s death by a present day New York art critic whom we first know only as Daniel, the strategic revealing of surnames being one of the conventions Mr. Winer uses to build suspense. Here, Mr. Winer introduces two leitmotifs that are repeated throughout the novel: thickness and falling. Both have literal or symbolic meanings depending on context. Thickness can mean fullness, describing moments of time so filled with life they seem thick. At other times, thickness is used to describe obfuscation or denial. Falling can be a literal fall, as in the prologue, or a fall from grace, a disappearance from history, or a falling away from faith and tradition, and ultimately the freedom of falling from the confines of life. Why was Aleksandra with Benjamin in the first place and why did they both die the same way after the opening of his latest installation, which was ostensibly about the dead of 9/11, but it turns out to be about far more? The work was composed of hauntingly serene intertwined figures apparently floating or falling through space. Shortly before her death, while sitting transfixed by one of the figures, Aleksandra told Daniel that his review had completely missed the point. Were she and the artist lovers? Was it a suicide pact? Were they pushed, or did one of them push the other then jump out of remorse? What WAS the point? These are the questions that drive Daniel to untangle the mystery of Benjamin Wind that started three generations before. It is an uncomfortable truth that the greatest life changing decisions turn on the smallest and most seemingly inconsequential moments. A small choice, which may even be forgotten, can so alter the course of one’s life that its repercussions can be felt for generations. So it is with Joseph Pick’s decision as a boy of ten living as a fully assimilated Jew in Vienna, Austria in 1928, to pick up a brush and become a marriage artist, a painter of ketubot, traditional Jewish illuminated marriage contracts. Josef’s father assimilated into early 20th century Vienna, Austria, by dropping his Jewish name, Pommeranz, becoming a Christian, and adopting the name Pick. The first indication the boy Josef had that he was Jewish was during an obligatory visit to the Leopoldstadt, the Jewish quarter of Vienna, where he is introduced to his Grandfather Pommeranz, a rabbi who made a meager living by blessing food and painting ketubot. Grandfather Pommeranz was an Ostjude, or a Jew from the Eastern principalities, who was decidedly old school, so much that he was an embarrassment to Josef’s father. Josef’s to follow in his grandfather’s footsteps and become a marriage artist alters forever his history as well as that of his posterity. Mr. Winer’s skillfully plotted novel is Josef’s story. Daniel acts as detective, seeking out clues and connections that are scattered about through nearly a century and over two continents, rooted in the antiSemitism of Europe the ultimate expression was the Nazi concentration camps. Each ketubah that the marriage artist paints is specific to the couple entering a marriage. The illuminated borders, similar in form to those found in the Book of Kells, are composed of images and symbols from each individual’s personality and family heritage and surrounds the Hebrew text of the actual agreement. It requires an understanding by the artist who paints it of what brought each couple together and the dynamics of each union—what exactly it is they are agreeing to. 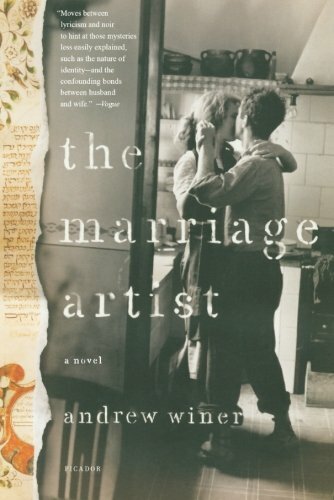 He tries, in painting his first ketubah for his parents, a vain attempt to fix their failing marriage, and his grandfather recognizes an extraordinary talent and insight and, under his mentorship, the boy does in time and with practice become one of Austria’s best painters. But there is a cost. In interviewing thousands of couples that will mostly end up leading “lives of quiet desperation” he loses faith. Failing to fix his parents’ marriage and failing to guarantee so many others, he soon becomes disenchanted with its value as an institution and even in the existence of love. It is upon meeting one of these doomed couples, the wealthy Herr Weiner and his young bride, that he forms a friendship with Weiner’s son, Max, a man who is to figure prominently in everyone’s life from that point forward. As teenagers, they make a solemn pact between them never to marry. That this particular friendship should have such intense ramifications in modern day New York with the death of Daniel’s wife Aleksandra and her alleged lover Benjamin Wind, seems as inevitable as a Greek tragedy. The two stories that of Josef Pick and Daniel’s investigation of the mystery of his wife’s death run parallel to each other throughout the narrative. At first we wonder what the two stories have in common, but our patience and our faith that they are inexorably intertwined is wonderfully rewarded. As Nazis invade Austria, there are a few fortunate Jews who have immigration permits to travel to Palestine. Josef Pick is not one of them. Hannah Englander is. Max, who is a fervent Zionist who has a permit, has arranged a marriage between them so Josef can use hers. They meet in the line to the marriage office. Max has a stake in getting Josef out of Austria and away from danger and in the marriage being merely a utilitarian relationship without a trace of love in it. Hannah has also vowed never to marry and was only talked into it at the last minute. It’s not that she dislikes men; she just doesn’t want to give herself to any of them. “Why would two people pursue a path that no matter how much pleasure it might lead to was guaranteed to produce pain? What makes people want to try something that will harm themselves (and probably others)? Is it because they actually enjoy suffering? The Marriage Artist is one of those rare novels that meet all the criteria for greatness: It entertains, informs, enlightens and finally and most importantly, it inspires. The magnificent writing is incandescent in the way the images illuminate the darkest corners of the human mind and heart and bring the forgotten shadow shapes that lurk there in to sharp relief. It is transcendent in the way it quickly makes those shapes that while painfully unique to each character, also universal. We come away with a greater understanding of our inner selves and the complexities of the human heart—an achievement that few other writers are able to achieve, and Andrew Winer accomplishes this with exquisitely evocative prose the like of which we rarely encounter.